In yet another twist to my highly acclaimed series of book reviews, I give you not a book but Bloom, a funny, one-act, two character play. And, in a slight variation of the accepted practice of reviewers not actually reading the book they tell you to buy, I also twist Jack London Reviews by confessing that I haven’t seen the play. Yet. Why? First, it is by Leeann Minogue. She is brilliant. I was blessed to go to London, Ontario, recently to see the national opening of her play Dry Streak (of which earlier versions were edited by, ahem, me. All my edits were wisely ignored). Dry Streak was the talk of Ontario. Heck, it was the talk of Canada, of the New World. Bloom will be brilliant. Second, I know Minogue’s work. She is a co-diplomate and, to be honest, class swot and favorite, of St. Cere, the literary mill of France where one of her editors (me) also trained. And, third, because I am going to see Bloom next week. In London. The Real One!!! 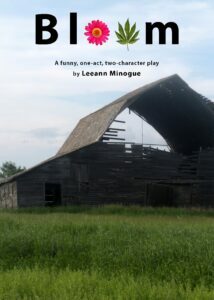 Leeann’s play, Bloom, will be read on June 20 at the Tristan Bates Theatre, 1a Tower Street, Covent Garden, London, England, UK, Europe, World. If you are anywhere near, book now. If not, wait for the review. It will be brilliant.